We wrote yesterday about a Harps Grocery Store’s decision to censor Elton John’s Us Weekly cover in Mountain Home Arkansas because he appeared in the photo with his partner David Furnish and their new son. You were rightly outraged, and the story became our biggest of the day. (Sorry, Attempted Gay Exorcism of Ellen!) By last night, the story had swelled to such epic proportions that Anderson Cooper and Dr. Phil both spoke up about how outrageously offensive it was on CNN. Long story short: The “Family Shield” has been removed. Apparently the decision to censor the loving family with a…family shield…was made by a manager of the Arkansas store on duty, and was not a chain-wide decision. Phew! 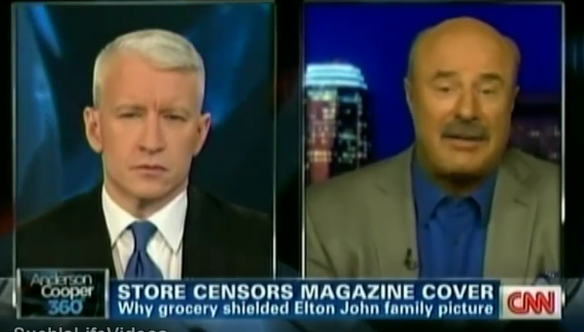 Cooper and Dr. Phil call the situation “very, very disappointing” and hope it serves as a learning moment for bigots everyone involved. What do you learn from this “learning moment”?